Dual Network Bridge Format Converter with up to 64 Bidirectional Channels and Asynchronous Sample Rate Conversion - Converts between MADI and Audinate Dante* - Bidirectional Asynchronous Sample Rate Conversion on every channel with bypass facility - Bidirectional output audio clock inhibit feature for redundant network systems - 24 bit audio operation with 96 kHz and 48 kHz sample rates - Video synchronisation in standard and high definition formats - Internal AES Grade 1 temperature-compensated word clock (1 ppm) - Status indicator LEDs and LCD display on front panel - Features Neutrik etherCON* network ports - Rugged 1U rackmount chassis for durability in portable applications - Auto-ranging universal switch-mode power supply - 3-Year Warranty Program** - Designed and engineered in England There are many different multichannel digital audio protocols available today. Some are well established and have been in common use for several years, others have appeared recently, and all are vying for recognition and market share. Interfacing different protocols can be difficult and expensive, often requiring the use of inflexible, proprietary hardware. Connecting different audio networks together, which often have differing sample rates and clock domains can be a difficult and expensive process. 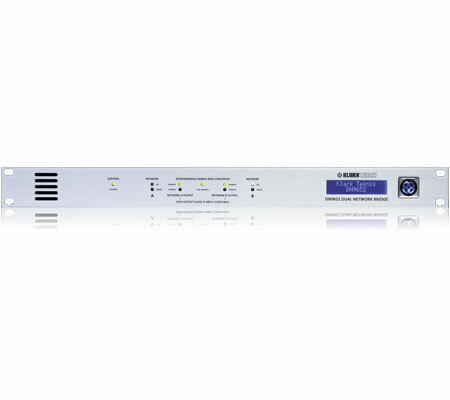 The DN9650 Network Bridge allows all MIDAS digital consoles and MIDAS digital I/O hardware, KLARK TEKNIK DN9696 High Resolution Audio Recorders and many other AES50 devices to connect to many different multichannel digital audio networks simply and reliably. Architect's & Engineer's Specification The Dual Network Bridge shall provide bidirectional asynchronous sample rate conversion of up to seventy-two (72) simultaneous channels of 24-bit resolution digital audio, between two third party network module interfaces in a standard 1U high 19” rack mount chassis. The Dual Network Bridge shall have one (1) Ethernet Control Port for the purposes of remote configuration from a computer web browser interface and the updating of internal software. The Dual Network Bridge shall have two clock domains (identified as A & B), one for each third Party Network, separated by an Asynchronous Sample Rate Converter (ASRC). The Sample Rate Converter shall have a Bypass option with the facility to lock one of the clock domains to the other. Each Network Clock domain shall support clock synchronisation to incoming clock via third party network module, Word Clock Input or Video Black Burst Input which shall support incoming video synchronisation signals in PAL/ SECAM/NTSC formats in Standard Definition (SD) and High Definition (HD) resolutions, as well as optionally slaving to the other clock domain if the Sample Rate Converter is bypassed. The Word Clock Output shall be capable of being derived from either clock domain or the Word Clock Input. The Dual Network Bridge shall have a precision clock reference provided by a temperature-controlled crystal oscillator (TCXO) with 1 part-per-million (1 ppm) stability. The Dual Network Bridge shall have user-selectable functions for both clock domains to stop an output clock if the corresponding input clock fails, to propagate network failures across the ASRC for the purposes of automatic or manual redundancy switchover. The Dual Network Bridge shall support data format word length truncation and dithering on data received and transmitted via the third party network module interfaces. The unit shall be capable of operating from a 100 to 240V ±10%, 50 to 60Hz AC power source. The Dual Network Bridge shall be the KLARK TEKNIK DN9652 and no alternative option is available. You Are Covered We always strive to provide the best possible Customer Experience. Our products are made in our own MUSIC Group factory using state-of-the-art automation, enhanced production workflows and quality assurance labs with the most sophisticated test equipment available in the world. As a result, we have one of the lowest product failure rates in the industry, and we confidently back it up with a generous 3-Year Warranty program.